Our Indigo 3050 digital press, manufactured by Hewlett Packard. The Indigo 3050 offers the best quality in digital printing. With its ability to produce brilliant colors, variable data and quick turn around, this is the most cost effective way to ensure short run quality color projects without over-paying for traditional offset printing. 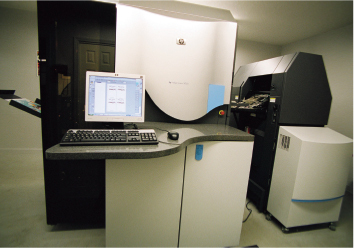 The Indigo 3050 produces a true litho dot up to 200 line screen. Short run postcards, sell sheets, mailers, and brochures can all be personalized to meet the needs of today's changing times. Give us a call for an estimate or for more information.